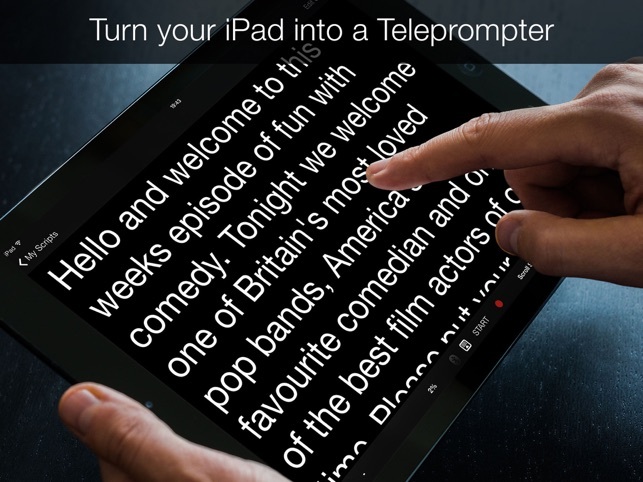 Teleprompter Pro is the top rated professional teleprompter system for your iPad, Used by thousands of TV & Production companies around the world! 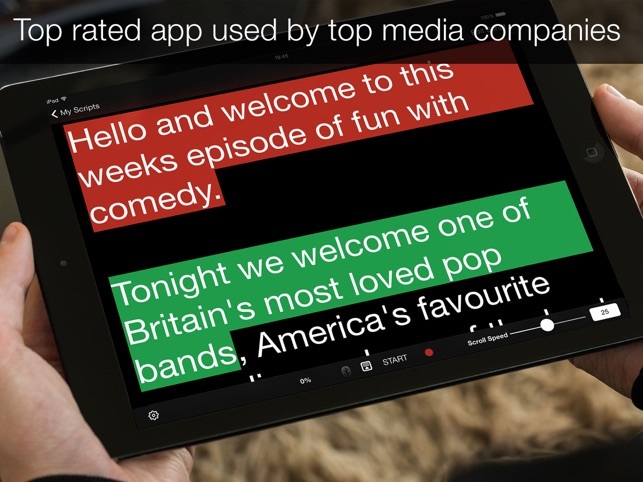 AS Featured in Apple's "Make A Film" Promotion! 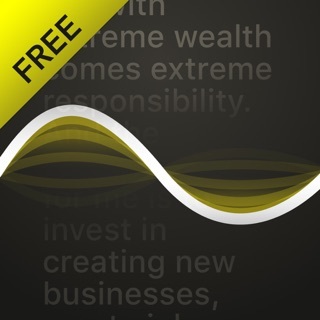 - Hundreds of 5 Star Reviews and counting! 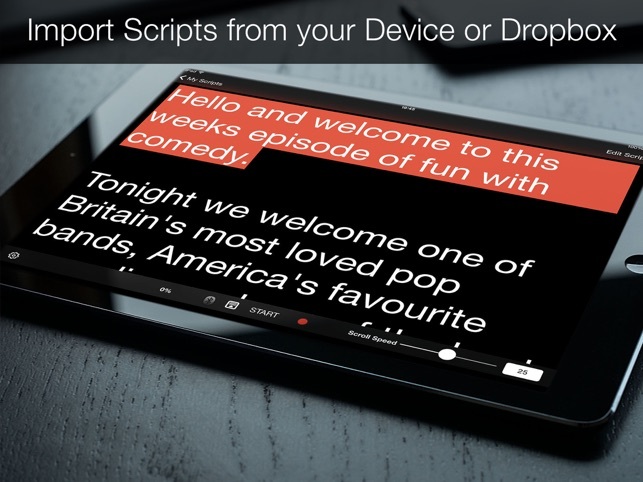 Now featuring wireless Bluetooth keyboard control, multiple scripts, script import, Dropbox Script import and more. 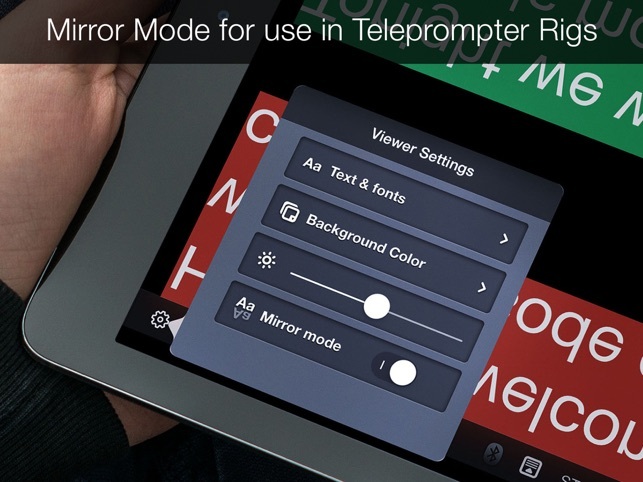 For Pro users mirror mode can be selected to use with any iPad-ready teleprompter system. 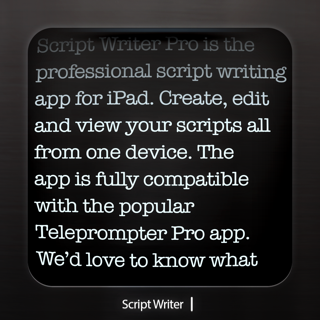 Teleprompter Pro is great for presentations, lectures, broadcasters, filmmakers, musicians & singers, business professionals, or any public speaking! 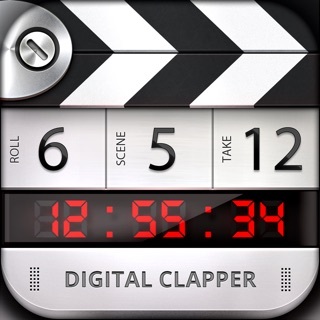 None of the TelePrompTer apps are perfect but this gets the job done. Definitely a fair price compared to others that claim voice tracking features which only work 50% of the time. Some improvements I see this app needs are: it didn’t read the txt files I imported so I had to copy and paste from an email, no ability to jump to beginning of script with a button rather than having to scroll, a wider “edit script” window, global speed controls, and titling the scripts didn’t stick... it kept defaulting to some random automatic naming convention. 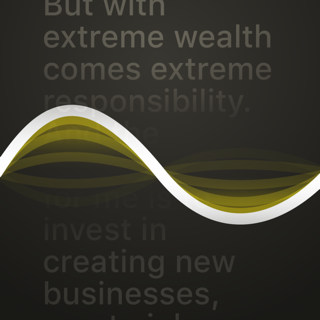 The software allows for the ability to customize the speed of the text, but there is no way to save this either globally or locally within the script. You have to reset the speed every time. Another issue that needs to be addressed, if you have enough scripts you cannot see the title when you enter it for new scripts Seeing what you’re typing is only a feature for the first six scripts. If these two issues were addressed, I would be much happier with this software. I gave a 1 Star but if I could I would have given a 0. This app is horrible. They do not tell you that the screen only stays horizontal and will not flip vertically which is how my TelePrompTer is. 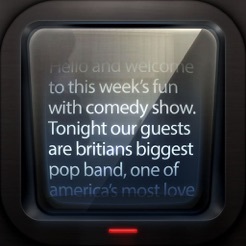 Not sure how you have an app that only caters to one design style of Teleprompter. 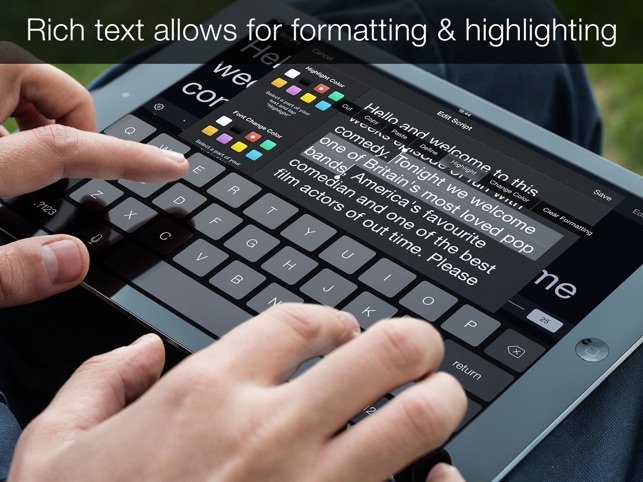 Also the script formats they allow is outdated I mean really only txt. What about word, and pdf. Also it won’t allow me to even upload scripts from my phone only through Dropbox. 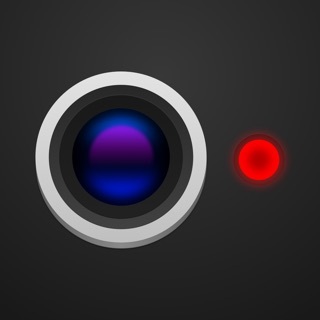 When I tried to contact the app developer there was no one to contact. 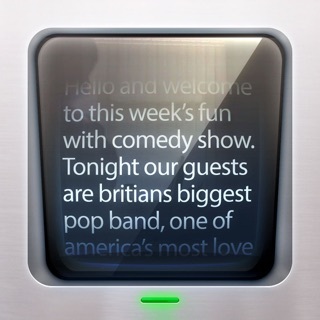 Worst App Ever!!! I want my money back will be calling my back First thing Monday to get it back.